Hall of Fire chat this weekend: who are the Drúedain? This Saturday at 6pm ET, Hall of Fire examines one of Tolkien’s more mysterious creations — the Drúedain. If you’re somewhat mystified as to who these people are, the name Ghân-buri-Ghân (who appears to help the Rohirrim in The Return of the King) may ring a few bells. There sat Théoden and Éomer, and before them on the ground sat a strange squat shape of a man, gnarled as an old stone, and the hairs of his scanty beard straggled on his lumpy chin like dry moss. He was short-legged and fat-armed, thick and stumpy, and clad only with grass about his waist. Merry felt that he had seen him before somewhere, and suddenly he remembered the Púkel-men of Dunharrow. Here was one of those old images brought to life, or maybe a creature descended in true line through endless years from the models used by the forgotten craftsmen long ago. Just who are the Drúedain? Why are they so intensely clannish (just likie dwarves, in fact)? And what might have inspired the creation of this “unlovely” and secretive people? 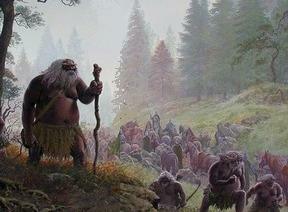 A forest people with no writing system and “guttural languange”, they seem uniquely placed among the Free Peoples of Middle Earth. Yet they were neither a breed of orcs nor had been corrupted by Morgoth. In fact they seem much more attuned to — and, perhaps, respectful of — Arda than their fellow Edain. The Drúedain were also one of the tribes of Edain that they went to Numenor at the end of the First Age. But how did did they make their way back to Middle-earth and, eventually, to Drúadan Forest? What is their connection with the strange Púkel statues of Dunharrow? And were they really in an ongoing conflict with the Rohirrim? Join this weekend in the Hall of Fire chat as we investigate one of Tolkien’s most intriguing enigmas.